Great customer experiences depend on engaged workers, but 70% of those workers either hate their jobs or feel completely disengaged, spelling slow motion disaster for many brands. There is a way out: empirical evidence shows that social technologies are one of the best ways to create engagement. A socially savvy workforce also helps avoid social media disasters, and well-designed social media guidelines are a solid foundation for successful social engagement. IBM was one of the first to codify social media guidelines. Starting in 2005, a group of blogging IBMers self-organized and used a wiki to build a set of guidelines to help avoid harming the IBM Brand. Rather than legalistic restrictions, the guidelines provided examples of good social behavior and simple ways to be proactive and positive. Because it was a wiki, it started to grow and encompass other social media platforms as well: Facebook, MySpace, Twitter. Seeing the growth, the community approached HR to help better align them with existing policies. IBM already had established Business Conduct Guidelines (BCGs), a short document that provides ethical direction in everyday language that all IBMers are required to be certified in. It was natural to adapt the Blogger Guidelines – now Social Computing Guidelines – into an official section of the BCGs. IBM also shares our Social Computing Guidelines publicly, widely recognized as a best practice in the industry. I want to share four tips that helped IBM craft our successful approach to social media, in the hopes that you can create the right set of guidelines for your organization. 1. It starts with culture. IBM has a great foundation for social: a culture that’s built on technology, collaboration, professional trust and subject matter expertise. The bottoms-up wiki approach took advantage of that culture. As the wiki was behind the firewall, our legal and audit teams felt we weren’t exposing ourselves to liability or competitive attack. When you’re ready to take social computing seriously both inside and outside your organization, the guidelines should start with your existing culture in mind. A consumer service startup is going to have a very different culture than a large regulated life sciences manufacturer. If the uniqueness of your culture isn’t taken into account, the guidelines will either be ignored or rejected. 2. Invite Legal and HR into the process – but don’t let them run it. Many employee manuals are written from a Legal or HR point of view, both of which have a strong focus on risk management. But social media was born in the wild west of the Internet, where sharing and openness rule. How do you balance these two competing approaches? The key for IBM was inviting Legal and HR into the process, but ensuring the writing was done democratically, representing all roles within IBM: developers, marketing, product managers, and sales. The process reduced both excessive risk reduction and pie-in-the-sky “information is free!” theory. It also reduced overly legalistic language in favor of plain english. #3: Less rules, more Guidelines. Social is all about trust. Giving your employees a long list of “thou shalt not” edicts is a sure way to show you don’t trust employees, dooming social from the start. So it’s important to truly believe that the majority of your employees want to do the right thing. What they really need is help to understand common pitfalls and how to deal with unexpected situations. As I mentioned earlier around Culture, though, each company’s culture is shaped by the industry and regulatory environment they’re in. In IBM’s case, we have special requirements like limits on technology exports outside the United States, so of course our guidelines cover when and when not to share that information. Overall, though, the guidelines minimize the forbidden in favor or best practices and positive, proactive guidelines. #4: Bottoms up and top down. Social empowers individuals to make connections outside of formal organizational structures. But organizations need a minimal level of structure, reporting, and auditing. Successful social media guidelines find a way to reconcile these two competing interests. By developing social computing guidelines from BOTH from the bottom up (democratic) and top down (risk management and strategic alignment) is a great way to balance those interest. In the end it’s all a balancing act: culture balance, Legal/HR balanced with employees’ need for expression, stricture vs. permission, and a mix of top-down and bottom-up. Striking the right balance can lead to a more socially engaged employee and ultimately a more engaged (and more profitable) customer. 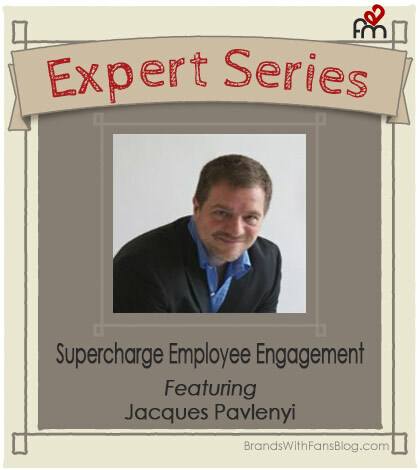 A passionate, social-media-savvy B2B and IT marketer for IBM since 1998, Jacques has managed many portions of the IBM portfolio, including data services to the chemical industry, WebSphere software for SMBs, telecom and media and entertainment solutions, and most recently as Marketing Program Manager for Social Collaboration Solutions. Jacques can be found on Twitter at @mediamutt.